Refrigerators are a necessity in everyone’s home because it keeps the food fresh for longer. It allows you to store food that you can still eat even after a few days has passed, making you save more money instead of scrapping leftovers after every meal. Refrigerators are a staple in every home and very, very few live without it. Because of its importance in a home, many types of refrigerators have sprouted. One of them is the newest style, French door refrigerator that comes with three big doors. 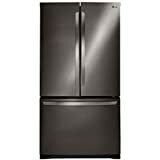 Here, we will review the: LG LFX25978 24.9 Cubic Feet French Door Refrigerator with Tall Water and Ice Dispenser. PROS: The ultra-large capacity at a smaller price compared to its peers, make this refrigerator the choice for families who would rather save a few hundred bucks. It measures 33” width and has a total storage capacity of 25 cubic feet, perfect for big families. The stainless steel body is smooth and very sleek and opening the doors feels like gliding. It’s both beautiful and functional. CONS: Like most problems that occur in refrigerators with built-in icemaker and water dispenser, this one experienced problems such as clogging. The button for the water dispenser is also difficult to push and the water that comes out from the dispenser is very small. The good thing is that it is relatively small so it doesn’t take up space inside. What are the important aspects of the LG LFX25978 24.9 Cubic Feet French Door Refrigerator with Tall Water and Ice Dispenser? Price: This French door refrigerator is considered average-priced as most models, regardless of brand, is priced either a little below $2,000 or above it. The benchmark for the price of French door fridges is around two thousand bucks. It’s up to you to choose the features that you want, with the according price increase or decrease. If you think that you don’t need the icemaker and water dispenser (which causes majority of the problems in a fridge), it’s better to skip this and just get a lower priced French door refrigerator. The storage capacity is also one of the main price indicator, so if you’re saving and don’t need much room, it’s better to pick a smaller one. You not only save money from buying a fridge, but you save space, and energy as well. Storage Capacity: The storage capacity of this refrigerator is slightly higher than the average. It is measured to have 24.9 cubic feet of storage while most average sized one have about 20-22 cubic feet. This size is enough for a relatively big family of about four to six members. A French door refrigerator is your best bet if you want to maximize the space that you have. This is because the main storage compartment housed by double doors is wide and comes in several tiers of tempered glass that you can customize according to your desired organization. The sides come in compartments for drinks, bottles, and milk boxes. The icemaker is installed in one side but it features a Slim Space Plus Ice System that is not bulky, so you have more space. The lower part of the fridge is a freezer that is accessible by a drawer. This drawer has several racks so you can easily separate and organize your frozen items. Features: The LG LFX25978 24.9 Cubic Feet French Door Refrigerator with Tall Water and Ice Dispenser has durable stainless steel façade while the handles and water dispenser paddles are made of thick coated metal. However, the door bins inside are made of cheap looking plastic but the main shelves are of thick tempered glass. Lighting the entire area are LED bulbs and the interior is surrounded by a Smart Cooling system that helps distribute air to keep leftovers from tasting stale and veggies and fruits fresh. The fridge runs quietly and smoothly however some customers have complained about the loud opening and closing of the doors. Counter Depth: Although this refrigerator is not considered counter depth, it’s relatively narrow compared to other models and brands despite the wide storage size. This is great if you want more storage but don’t want the fridge to take up a behemoth space in the kitchen. If you really want to get a counter depth refrigerator, you’ll have to sacrifice the storage space as most of the models come in only about 20 to 22 cubic feet. What other information should you know about the LG LFX25978 24.9 Cubic Feet French Door Refrigerator with Tall Water and Ice Dispenser? 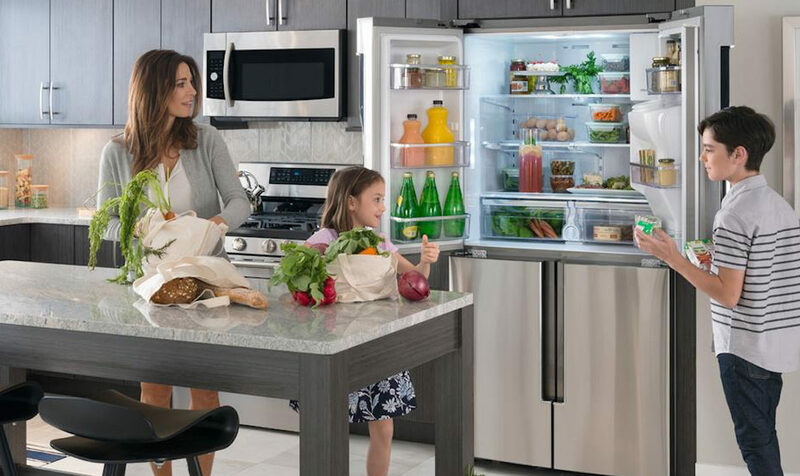 This refrigerator comes in a one-year manufacturer’s warranty but if you want more peace of mind, you can purchase an additional four years warranty for about $160. We recommend having the extended warranty, as it’s just a small additional price to pay, considering the overall expense of the refrigerator. When you encounter problems, an extended warranty saves you from paying technicians to check and fix your refrigerator. This is not to say that the refrigerator would require it all the time; the warranty is just there to cover your fridge in case of problems. Also ask about the delivery service of where you’ll buy it. Many customers who bought this particular model have experienced bad delivery service, with some asking for a fee for taking the fridge inside the house. Without the fee, they would only leave the fridge outside in the foyer. Make sure to clarify so you’ll get the best experience. When it comes to function and durability, the LG LFX25978 24.9 Cubic Feet French Door Refrigerator with Tall Water and Ice Dispenser really stands out. It is made of high quality materials, backed by the warranty of a reputable brand so you can expect years of content usage with this refrigerator. For the price, this is a great buy considering the features and the storage size you get. Other brands and models will charge you $500 more, but this one has it all for less. Definitely weigh your options first before committing to buy anything so you’ll get the best out of your budget.